There are certain ephemeral cases which can crash PRG. The first step is to try restarting PRG using the same XML file. 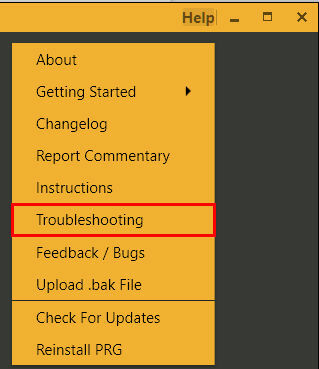 PRG includes a few generic troubleshooting steps which can be accessed from Help > Troubleshooting. The most useful troubleshooting step to take if you’ve received a ‘FATAL ERROR’ is to generate a BAK file of the PLS-CADD model and restore a copy to your main drive ( C:\prg ). PRG mines data from many files within a PLS-CADD project. Working off of a local backup helps to prevent file locking and dependency issues which can occur if a PLS-CADD model is stored on a network storage device. If a retry and general troubleshooting do not resolve the crash, the issue lies in PRG’s internal representation of a PLS-CADD model. These issues typically require reproduction in order to fix. Immediately after submitting a crash report, PRG will prompt to upload a BAK file for the model which crashed PRG. In some cases it is possible to resolve issues without the BAK file, but to ensure your issue is properly resolved, please include a BAK file along with your crash report.